Chairwoman Ann Budge and director of football Craig Levein begin clear out. 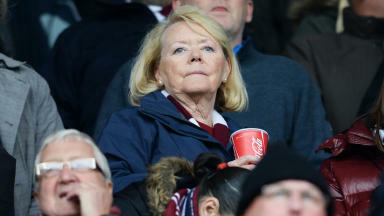 Hearts have told a number of first team stars they have no future at the club as new owner Ann Budge begins her reign at Tynecastle. Jamie Hamill, Ryan Stevenson, Jamie MacDonald and Dylan McGowan are believed to have been told they will not be given contracts for next season. Back-up goalkeeper Mark Ridgers is also to leave, along with Under-20s midfielder Callum Tapping. STV understands that youngsters Sam Nicholson, Gary Oliver and Jack Hamilton will stay after being offered new deals. Mrs Budge and her newly appointed director of football Craig Levein have been meeting with players and staff at Tynecastle on Monday. 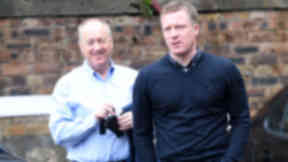 Earlier in the day manager Gary Locke, his assistant Billy Brown and goalkeeper coach Alan Combe were all told they would not be kept on under the new regime. Hamill, 27, joined the club in 2011 on a free transfer from Kilmarnock. He made 82 appearances, scoring 15 goals. Speaking outside Tynecastle after a "25 second" meeting with Levein, Hamill said: "I feel for the gaffer, Billy Brown and Alan Combe because they have worked miracles at times. "I thought the fans wanted Gary in charge - the players would have loved him to be there - but at the end of the day these are difficult decisions. "It feels unfair but Ann Budge has put her money in and hopefully the club will be out of administration as soon as possible. "It is a bit harsh but that's the world we live in - it's football. "I wish them every bit of luck I hope they can get themselves back to where Hearts belong." Hamill went on to say he was "bemused" by the decisions to also release Ryan Stevenson and Jamie MacDonald. He added: "I'm bemused with that and I'm devastated for Ryan because he still had a year on his contract and he's been brilliant this season. "Jamie MacDonald has been our best player for two seasons. That's some challenge for the next keeper who comes in." Ryan Stevenson spent two spells in Gorgie, moving from Ayr United in February 2010, before leaving for Ipswich Town in January 2012. He returned to Hearts under John McGlynn in August that year, making 128 appearance and scoring 24 times. Jamie MacDonald, 28, came through the youth ranks at Riccarton, making his debut in 2008. He played for Hearts 136 times, winning the club's Player of the Year award in 2013 and 2014. Dylan McGowan is understood to have decided to leave Hearts earlier in the season. The 22-year-old Australian made his first team breakthrough in 2013 and played for the Jambos 64 times.